An illegal immigrant falls from the sky, and NYPD Homicide Detective Nikki Heat's investigation into his death quickly captures the imagination of her boyfriend, the Pulitzer Prize-winning journalist, Jameson Rook. When he decides to work the case with Heat as his next big story, Nikki is at first happy to have him ride-along. Yes, she must endure Rook's usual wild conspiracy speculations and adolescent wisecracks, but after reuniting following his recent assignment abroad, she's glad for the entertainment, the chance to bounce ideas, and just to be close to him again and feel the old spark rekindle. But when Rook's inquiry concludes that Detective Heat has arrested the wrong man for the murder, everything changes. Balancing her high stakes job with a complicated romance has been a challenge ever since Nikki fell for the famous reporter. Now, her relationship lurches from mere complexity into sharp conflict over the most high-risk case of her career. Set against the raging force of Hurricane Sandy as it pounds New York, Heat battles an ambitious power broker, fights a platoon of urban mercenaries, and clashes with the man she loves. Detective Heat knows her job is to solve murders. She just worries that solving this one will be the death of her relationship. But to be totally honest, if you look at this book in a non-Castle-comparison way, it was a very well written crime thriller. But then it would drop meta-details here and there, with that continuous subliminal message to "Watch Castle the television series on ABC", and I'm back to making my comparisons. 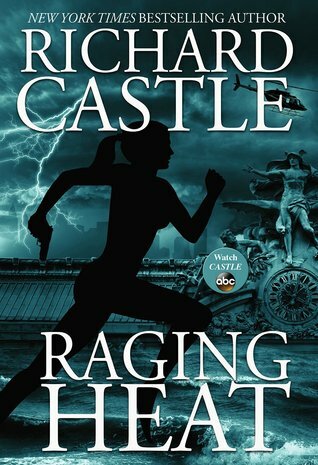 All-in-all, I am actually very pleased with this installment of the Nikki Heat series--it may even be the better written, personally most favorite book of this series to date. I haven't yet read the newest release, Driving Heat, but I am very much hoping for some of the same kind of writing, narration, and story progression. Simply put, I am very much pleasantly surprised. And while the meta-references to Castle can get a little tedious, I actually DO like those extremely rare references to Firefly. This review was originally posted at Ani's Book Abyss / BookLikes in October 2015.